Last night my husband Pallab and I went to a meeting, a fun meeting, and a meeting of the Stroke Recovery Association. All the people who attend this meeting have recovered from stroke which basically translates into, they came out alive from the stroke, but the beast of stroke has left its bite marks on their bodies. All over the gathering there were signs of injuries and scars from the visit of stroke. Nobody in the meeting had a perfect body there was some defective body-part with everybody. With many it was written right on their faces, with a couple when they smiled their lips walked over more to one side than on the other.. One can call it an asymmetrical smile or a funny smile; one gentle man excused himself for his speech. When he spoke all the air came out from one side, one can call it speech impediment, or one can call it a funny speech. Everybody in the meeting carried something funny, although to be brutally truthful there was nothing funny in their disabilities. At the beginning of the meeting the news of passing away of three members was announced, one woman and two men. That is the rule of the meeting. It always starts with announcements of the deceased, folks who had passed away in the last one month, since the last meeting. We all are aware that life is fragile and that we all are mortals but in this group we are extra aware of fragility of life and also of our mortality. We all are aware; I am on this earth in this moment, but in the next moment? Who knows? I recalled the Shefali flowers in Calcutta. In early dawn as soon, as soon as the first light of dawn broke, the flowers were shed from the trees, their death sentences were announced. Small girls like me walked around with tiny wicker baskets collecting the flowers in the baskets picking them up neatly from the ground under the trees. 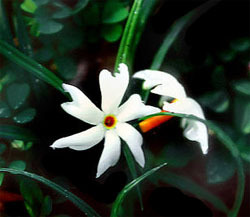 Tiny flowers with white petals arranged in a cartwheel all attached to a bright orange stalk. If I found a water tap on the way, I sprinkled water on the flowers to keep them alive for ten minutes longer. Then my grandmother had a few extra minutes to place the flowers at the feet of the Almighty on the family altar, to perform her morning pooja. I watched other girls blowing gently on the flowers to achieve the same effect, to keep them alive slightly longer. I didn't believe in blowing on the flowers. At the meeting, no matter how many times a day we repeated the mantra of taking one day at a time and living one day at a time to the fullest, we all knew how temporary life was. A few minutes in the meeting, came four Scottish musicians two females and two males. They played heavenly music with bagpipes and they danced. Our spirits lifted. Then came a singer very young in his early 30s, or early 40s he was tall and thin. He walked with great distress, with each step he twisted his lower limbs and his hip twisted as well. How much hip pain is he in? I wondered, he went to the microphone at the podium and opened his mouth. A steady thick sweet manly voice emerged. He sang several songs, all Scottish songs. Obviously this was a Scottish theme evening. I was thoroughly taken by his music, my heart and soul immersed in his song, his voice climbing up and sliding down smoothly, as a lonesome woman called for her man, who was out in the ocean then a mother called for her son also out in the ocean. I asked the man sitting next to me what is the singer's name? He answered Mack. He added Mack was born with a stroke. In the hospital His mother had looked out the window and had seen a Macdonald's Eatery and that's how she named her son Mack. Then he amended, Mack has made good use of his life. He is a tattoo artist, he is married to Martha, and they have two children a son and a daughter - the so called million dollar family. My heart was immersed in Mack's thoughts Mack, however, was thinking about Martha. They were going through a rough patch in their marriage, possibly as a result of the despair. Mack's muscles had weakened significantly. He hadn't been able to work for eight months. He hadn't been able to do any household chore either. During this time, Martha had been the sole bread winner of the family, had paid the bills and had looked after the household and the children. This had caused the sore spot in their relationship. At times Martha said I might as well move out with the children and live by myself. In that way I wouldn't have to take part in the daily bickering. Mack couldn't give any answer, he stood there speechless, stunned and shocked, he knew getting him out of the way for a better life was not illogical on Martha's part. At the meeting Mack sang a third song, then a fourth one, finally a fifth song, then he stood in front of everybody with his head bent over on the podium with fatigue and dejection. As he returned home, somehow the rooms looked emptier and the house was totally silent. There was not a peep from the children. On entering the bedroom as he opened the closet he found out that Martha's side of the closet was empty. Skirts on the right side were not there. Her dresses in the middle were not there. Her coats on the left were not there either. At the bottom Martha's shoes were also gone. At that point he realized Martha had left him. Along with her their two children were also gone. He had no doubt that Martha would get the custody of the children. She was a good mother. And which judge in his sane mind would grant custody of two young demanding children to a father who was unemployed and significantly disabled? As he went to the kitchen and saw a cup of tea already made sitting on the countertop, he realized it was the very last cup Martha had made for him. He pondered. He took a couple of sips of tea. He sat down in a kitchen chair, his heavy head dropped on top of the table. His head was heavy with dejection, failure, despair, a barrage of torments and intense loneliness. 'My life has ended,' he mumbled under his breath then he mumbled 'today at the stroke recovery meeting I announced the death of three members, at the next meeting somebody else would announce the news of my death and that's how life would go on by enjoying every day, by living everyday to the fullest, Finally when the final day arrives, he would end it on his own terms. He had already planned it. A long time ago. He tilted his head backward and caught a glance of the large hook drilled in the rafter. He had screwed it in there together with Martha in order to hang a chandelier, given to them by a dear friend. Once again he sat down at the kitchen table, with his head bent, his forehead resting on the table. He realized, his head bent forwards from the weight of dejection, disappointment and disenchantment. Or, perhaps my neck muscles are exhausted from carrying the weight of my head. He knew the former version was the truth; the latter was just an excuse. Once again he looked up, glanced at the hook and imagined how in one month's time his body would hang from there, his mind and soul cool, calm collected and composed. He felt tempted. For such a long time he hadn't felt any inner peace, he reminded himself. This evening he had lost the grasp of the last straw. That really, truly broke the camel's back. That was how my singing shefali flower wilted.